Something is amiss with power. One might argue that it is shifting - from West to East, from developed to emerging markets. But something else seems afoot, something hard to pinpoint and articulate, perhaps because it is still nascent. In the U.S., we've witnessed seven government budget showdowns in three years. There's a growing sense that Washington exists in a state of gridlock. It's hard to tell which party actually has more power at the moment. Is this merely a battle of wills between left and right, or is there some other force at play? Several times last month, President Obama said - famously or infamously, depending on your perception - he's "got a pen" and will use it as he sees fit to circumvent gridlock. Depending on where you fall with President Obama's plans, this is either a relief or upsetting. But it might also be irrelevant; people only grasp desperately for power when they sense a loss of it. How did this come to be for a president with one of the most passionate bases in decades? To whom is President Obama losing power? Democrats and Republicans in Congress seem equally ineffectual. What is going on here? Why can't Washington get much done? Why are so many people fed up with politics and politicians? Why have so few presidents in decades been elected with a clear mandate? Why do we continually elect a Congress that sits in opposition to the president, as if we're voting for gridlock? And why is voter turnout plummeting even though frustration is skyrocketing? The world has changed so much and so quickly that it's hard to comprehend all the ramifications. Yet we can comprehend that most facets of our lives have changed fundamentally and dramatically. But our politics have not. Our political infrastructure has not. Our government has not. Yet. In a thought-provoking TED talk, Paddy Ashdown, former member of the British Parliament and diplomat, says he believes we are in the early stages of one of those great global transformations, where stability is replaced by turbulence as the world adjusts to a new balance of power. 1) Power is shifting vertically - from nation state to global stage. The power of satellites, Internet, and global economic money-changers all exist above the nation state. History tells us that where power goes, corruption follows, and then so too must regulation. Ashdown believes that countries working together to determine some sort of global governance (not to be confused with a global government) will be the great challenge of our time. 2) Power is shifting horizontally. Ashdown suggests we are shifting from a Washington-dominated, mono-polar world back to the multi-polar world that has existed for the great majority of human history. In this world, alliances are not fixed, but circumstantial. 3) Everything is connected to everything. Our interests are now completely interlocked with every other country's. Someone gets swine flu in Mexico, it's an issue at Charles de Gaulle airport 24 hours later. The notion of national defense is forever changed. This interconnectedness means we all now share a destiny; it is no longer enough to worry if our own country is safe. As a confluence of factors, Ashdown says that the vertical, command-control structure of government is now irrelevant and outdated in the new era of distributed global power. The new power paradigm of our time is the network. About this he says, "In the modern age, where everything is connected to everything, the most important thing about what you can do is what you can do with others." The most important quality of power is no longer some elusive asset of the powerful, the elite, those who are in charge; it is now the ability to network with others. This also means that power is dissipating from the institutional level and getting dispersed amongst individuals. Those who can forge productive alliances can grow their own personal power. In the U.S., instead of embracing the power of connectivity, politicians are scrambling for power, adhering to ideology and rhetoric in an attempt to pander and placate. More and more, voters see through this. There is a growing and palpable disgust with politicians in both parties and the options they present. (In 2013, congressional approval rating averaged 14%, the lowest annual average in history.) This has reduced voter turnout and causes frustrated voters to elect governments that produce gridlock. It has produced groundswell movements like the Tea Party and Occupy Wall Street. These trends are not happening just in the U.S. Look at the Arab Spring, the riots in Ukraine, turmoil in Thailand, and the microbloggers in China who are finding shrewd ways to outsmart censorship. Voter turnout is plummeting globally. Voters in 30 out of 34 of the OECD countries have elected a congress or parliament of the opposing party of its leader. Former Ministry of Trade for Venezuela and editor-in-chief of Foreign Policy magazine for 14 years, Moisés Naím takes the theory of power dissolution a step farther. He believes power is ending, that it is devolving and degrading in the 21st century, that it is getting decentralized and redistributed to smaller factions, which can be anything from more localized governments to groundswell movements. Naím sees this trend everywhere, in governments, businesses, media, religions and even militaries. Historically, those in power have possessed something that is hard for challengers to replicate, which forms a shield to their power. For politics, it could be charisma. For businesses, a technology or brand. For militaries, their weapons. Naím suggests these shields are now being eroded by three revolutions. The first is the "More Revolution." Today we have more of everything - more people, more political parties, more access to information, more countries. More moves more; more people create more momentum, and more technology allows momentum to escalate faster, and this is the "Mobility Revolution." More plus mobility has caused profound changes in how people think, which is the "Mentality Revolution." Globally, we've seen a dramatic shift in values, aspirations and expectations, as more people want more rights, freedoms and opportunities. In Naím's theory, the "More" helps dissidents overwhelm the shields that protect power. The "Mobility" circumvents the shields. And the "Mentality" undermines the shields. The net effect is a world where power is "easier to acquire, harder to use and much easier to lose." Key to this development is technology, and how easily it allows ordinary people - the "not" powerful - to organize and collaborate and serve as very real competition to those in charge. For the first time in history, small threats to power can actually overcome legacy power. What this means for us Americans is hard to say. The notion that power and the powerful as we've known them are losing relevance is very leading edge; there's not a great deal of thought leadership on it - yet. Most of us know that the world, and our country's role in it, is changing. Very few of us can yet comprehend what this means and what the future will look like. In the new power paradigm, it is no longer about how our country's role is changing in the world, it's about how every country's role is changing in the world. Everyone's actions now impact everyone else in this new era of interconnectedness and interdependency. In this issue of TLV, we attempt to present some ideas that seek to understand the shifts in and dismantling of power, and invite you to imagine how it may unfold. "Power does not corrupt. Fear corrupts. Perhaps the fear of a loss of power." Does the United States have a minimum wage problem, or do we have a problem creating enough jobs that pay more than the minimum wage? Does the United States have a minimum wage problem, or has government policy driven up the cost of real estate, the cost of regulation, the cost of insurance, the cost of education, the cost of health care, the cost of retirement and the cost of everything, such that a "livable" wage has to be mandated by government edict? And if government is ever so capable developing policy, then why have median wages in this country stagnated for two decades? How can we expect a government populated by academics, career politicians and career bureaucrats to develop productive policy over private sector economy, the real economy? If economic policy is not working well, then government is required to come in and "save" the disenfranchised. Poor economic policy results in more and more of a need for government intervention in social policy. Our economic policy is largely developed by people who have never held a private sector job, never worked at McDonalds, never built a house, dug a ditch, made a widget or done anything that drives private sector economy. Political gridlock may be good at preventing enormous policy mistakes, but in a world that is changing faster and faster every day, do we not risk losing out to more nimble global competitors? Whenever you have a very very large and very very complicated problem, what's the easiest way to solve it? Is it to throw more money, more people and more administration at it? Not likely. That would seem only to make the very large, larger and the very complicated, even more complicated. Instead, it seems we need to break very large and complicated problems down into much smaller, more manageable units to solve. End result? The contraction of our legacy power infrastructure. According to a recent report from The Manhattan Institute, an economic think tank, since the last recession, the oil & gas industry has seen job growth of 40%, while the shale revolution has been the country's single largest creator of solid, middle class jobs. Why is this so difficult for policymakers to understand? Everything we touch every day has to start out from some raw material that comes from some natural resource. The more natural resources we produce, the more processing plants we need to build to convert them into raw material. The more raw material we have on hand, the more plants we need to build to turn that raw material into a manufactured finished good. Let's not forget the transportation and storage infrastructure required to handle this expanded natural resource, raw material and finished goods production. When politicians talk about infrastructure investment creating more jobs, why do they seem to forget the enormous infrastructure investments happening in today's oil & gas shale revolution? All this new infrastructure, financed by the private sector, is creating thousands upon thousands of good paying middle class jobs. A recent joint report from consulting firm McKinsey and law firm Vinson & Elkins suggested that the total private sector investment in and around the shale revolution could reach as much as $2.5 trillion through 2020. How does this compare to the Obama administration's recent announcement of the government's four-year budget to "invest" $302 billion in transportation infrastructure? Hey, Washington! Want to solve the minimum wage "problem"? Want to create more middle class jobs? How about removing the shackles of regulation and climate change religious extremism from our natural resources, processing and manufacturing industries? Pay attention to the daily news, and you will certainly become dependent and influenced by the media's well-crafted and self-serving agenda. Read books and regularly talk amongst your peers about the real issues of the day, and you'll be much more capable of seeing through the fog of too much information and political rhetoric. Might it make sense to stay away from conventional wisdom? After all, when was wisdom ever conventional? The volunteer rate declined by 1.1 percentage points to 25.4% for the year ending in September 2013. About 62.6 million people volunteered through or for an organization at least once between September 2012 and September 2013. The volunteer rate in 2013 was the lowest it has been since this report was first administered in 2002. By age, 35- to 44-year-olds were most likely to volunteer (30.6%). Volunteer rates were lowest among 20- to 24-year-olds (18.5%). For persons 45 years and over, the volunteer rate tapered off as age increased. Teens (16- to 19-year-olds) had a volunteer rate of 26.2%. Among employed persons, 27.7% volunteered during the year ending in September 2013. By comparison, 24.1% of unemployed persons and 21.9% of those not in the labor force volunteered. Among the employed, part-time workers were more likely than full-time workers to have participated in volunteer activities - 31.7%, compared with 26.8%. The volunteer rate was little changed among unemployed persons but declined for the employed and those not in the labor force. TLV Comment - Might the ever growing role of government be reducing people's interest in volunteering? If government has our back, all the time and for everything, why should private citizens care about volunteering? Who cares about personal responsibility if the government is in charge of everything, especially if citizenry believes government is for and by the special interests? In the 15 presidential elections from 1900 to 1956, nine of our presidents won the popular vote by 10% or more, a veritable landslide. In the 14 elections since, only three presidents have been elected by a margin greater than 10%. One could surmise several reasons for this, but one thing is clear: Fewer and fewer of our presidents are elected with a clear mandate, complicating their relationship with the American people and their ability to achieve initiatives. In this talk, Moisés Naím explains why power is being decentralized and redistributed to smaller groups and factions - in governments, businesses, religions, media and the military. Perhaps one of the most interesting cases is the military. The most recent transformational technologies in the military realm are drones and IEDs. What's so game changing about them is that they are not under the exclusive control of the military; anyone can make an IED. In WWII, 5% of American casualties were the fault of land mines. In Afghanistan, that number is 75%. Naím references a study where a Harvard professor looked at asymmetric wars, where one side was, by the numbers, far stronger. Between 1800 and 1949, the weak side won battles 12% of the time. Between 1950 and 1998, the weak side won 55% of the time. We highly recommend watching this video (or reading Naím's book, The End of Power) for more incredible examples of how power on paper, so to speak, is losing its, well, power. Michael Anti (aka Jing Zhao) is one of China's 300 million microbloggers. In his TED talk, Anti explains the sensitive and complex game of cat and mouse that bloggers and all Chinese "netizens" (users of Internet) play with their censoring government - with objectives, twists and strange alliances you won't expect. Anti explains how microbloggers shrewdly coordinate and conspire to outsmart censorship. The result is 500 million netizens in China, who are, for the first time in centuries, finding a voice. This allows Anti's most captivating point: Thanks to social media, freedom of speech is no longer an imported Western idea, but something that - for the first time in China's history - the Chinese are beginning to believe is a birth right. Americans certainly know where such a powerful belief can lead. William Playfair (1759 - 1823), a political economist from Scotland who invented graphical methods of statistics, wrote a book in 1805 that attempted to understand why wealthy nations eventually fail. 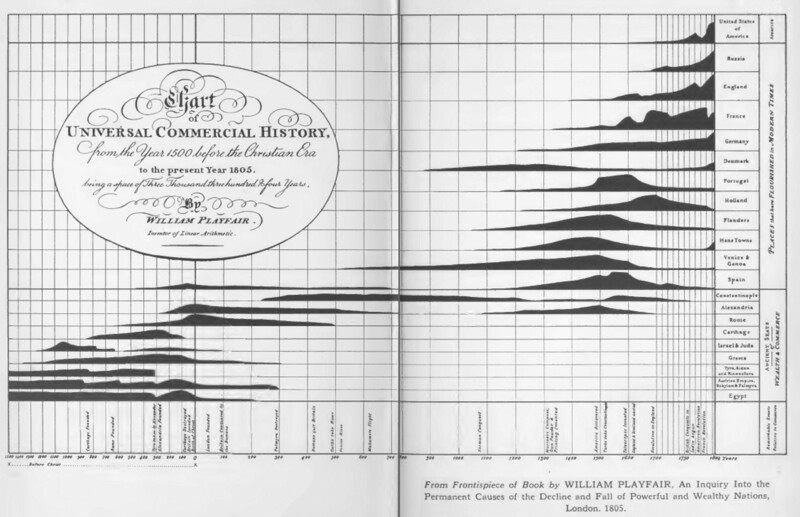 The following 209-year-old chart is from the front of that book. The top right axis reads, "Places that have flourished in modern times." Below it reads, "Ancient seats of wealth & commerce," and includes places like Constantinople and Rome. The bottom axis starts in the year 1500 AD and ends in 1804, with notable historical moments written along the axis. At the time of drafting the chart, Russia, England, France and Germany were the global super powers, and the U.S. was a true emerging market. Click here or the image below for a zoomed in version. This clever map shows which country has a nearly equitable annual GDP to each American state. Note that the data is not adjusted for population. As an example, Minnesota's population is 5.5 million, while Nigeria, with a population of 175 million, shares a comparable GDP. After spending three years analyzing Abraham Lincoln's life to understand his people skills, Dale Carnegie wrote the book Lincoln the Unknown. In it, Carnegie publishes a scathing letter Lincoln wrote to a general who disobeyed his orders to capture General Lee in the Civil War. However, Lincoln never sent the letter, an action that Carnegie believed said more than the letter itself. Carnegie deduced that Lincoln ultimately used empathy to see that the letter would not only damage his general, but the overall goal of winning the war. Follow the link to read the letter and three points of leadership advice inspired by Lincoln's high-level people skills. A recent report from UBS looked at the spending and saving patterns of investors between the ages 21 and 36. 52% of the average millennial's portfolio is in cash, compared with 23% for other investors. Millennials also believe that a frugal lifestyle and hard work is more likely than investing to create wealth. This mindset was found to be predominately the consequence of the Great Recession. Might a new Greatest Generation be emerging? The Senate has increasingly been forced to file for cloture to compel an up or down vote on judicial nominees. This is because the minority is more frequently attempting to filibuster judicial nominees. The cloture vote is the last available tool to end the standoff between a filibustering minority and an annoyed majority. When cloture is rejected, the "losing" side is out of options. The chart shows the number of times cloture has been used in judicial approvals since 1993, as well as the number of times cloture was invoked or rejected. For those who wish to delve further into this month's dismantling of power theory, you may want to pick up a copy of Walter Wriston's 1992 book, The Twilight of Sovereignty. Former Chairman of Citibank, Wriston projected the result of technology's rampant growth in global ubiquity. His conclusion was that closed societies, those overly-managed societies like the former Soviet Union and Communist China, would get trashed by their population's ability to access real, rather than filtered, state-serving information. But what Wriston failed to consider was how that very same technology revolution would threaten the legacy power infrastructures of what we consider today's advanced economies.